I have never had such a serious case of ‘what can go wrong, will go wrong’ in my blogging days, as I did today. It actually started last night, unable to save a picture, I was actually getting popups saying ‘Cannot save image’ which I don’t remember ever seeing in the past. Then relog after relog, and then I was a cloud. After all of that, I just went to sleep. Waking up today I knew at least I was dressed and ready to go, but again, the same cannot save issues. Relog, reinstall and retry, the three new R’s of my life. I decided though after all that to try with the alt I use for The Deck, and it saved…logged back in to main and voila, saved. It goes to show having an empty inventory account on the side is sometimes a benefit. Then after all of that, I realised that I didn’t have my hands on…how did we ever cope without them I do not know, but ugh. So took new pics and then realised OMG I forgot to put my hands on AGAIN. But I kept going, because I love this outfit I put together from some way old LeLutka items, and some new and exciting pieces from events. Also to bring attention to the amazing new hair by LeLutka based on Fairy Tales, which is their second foray into this treasure trove of inspiration. The Rapunzel hair is a beautiful long braided style that with the help of mesh and rigging, actually will move as you do…this is one of those things that really makes you so grateful that we have rigging and mesh now. The hair also has a special GIFT, each style in the new release actually came with special gifts, so make sure to look for them in the folders. The gift with Rapunzel is an adorable Chameleon shoulder pet, he has moving eyes and an up or down tail option with 5 great colours to choose from. The other great thing is that you can resize him and rez him in world so you can have little friends all over the place. At first I was going to go all pretty and girly as the hair just brings out that mood, and then I remembered that I had the Liu skin by Glance that I had not yet blogged. So thinking of Miss Liu lead me to Charlies Angels and that lead me to Spy’s and that lead me to this look. The bolero and hat are older items from LeLutka, but so in keeping with the great wintery looks popping up all over the place. The bolero is definitely a favourite, and I hope that one day this is an inspiration to doing something similar in mesh, we definitely need more stoles, and bolero like looks to put over the top of mesh that won’t interfere with the movement of the main item. The shirt I am wearing is by Nylon Outfitters, which is featured at this months Collabor88. The tee is beautiful, it is lace and backless, with the back being tied off in a beautiful ribbon tie look. The scalloped bottom is divine, and all in all a must have item that also has bra tops that go under but don’t go as far as the back – me thinks that Nylon spent the time to carefully sew them inside of the tee. Because the top is system layered and comes in great colours, this would also look divine underneath something, such as a corset or gown , something strapless perhaps with a low back to give it a boost, you will have to play around with that idea once you get the tops. Another item I really liked the back of, as well as the front, is the Cross belt by LaGyo. This is actually their The Dressing Room Fusion item, and it is resizaable, I was going for a hip fit look, but when I resized it and moved it down, it had resized too much front and back, so it doesn’t really work that way too well, not on my shape anyway. But it looks great were it is intended to sit, and there are other metal colours available also. 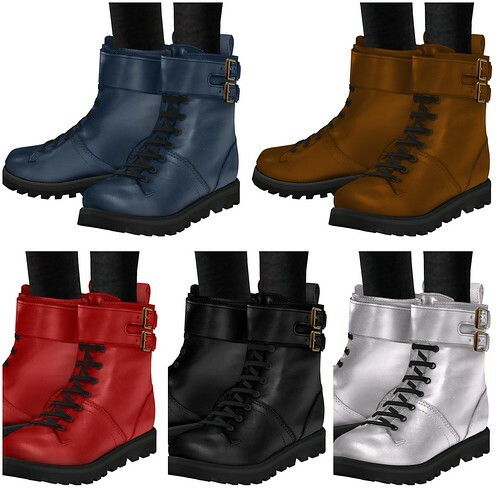 The boots I am wearing are these very cool ankle boots by Monso. Monso has released them for Collabor88/December, and the great thing about them, is that they are available in Male and Female versions, so no one has to miss out. They are a great style, with great buckle and stitch detailing. They come in an assortment of colours, so be sure to try them for yourself. Slipped inside of the boots are the great wool leggings from D.Select, part of the Deetalez brand. 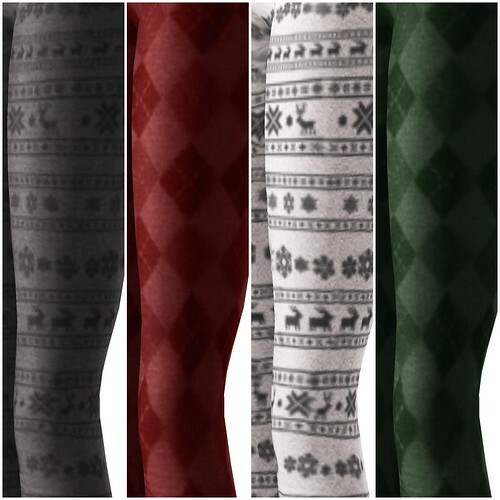 They have done a huge release of late, with leggings in wools as well as nylon and a good range of wintery themed prints. I am definitely all about the argyle ones, they are very cool also. I took some pics of the various colours and prints you can get, so check those out if you are looking for some wintery woolies. The skin by Glance comes with brown and black brows, regular and big bust cleavage options (part of the skin) no brows as an option or thin brows…I am wearing the regular brows in my pics. There is also a tattoo layer for no freckles and no freckles shine, which gives a little more highlight to the face. Then the make up packs come with 10 shadows, 10 glossy lips and 10 matte lips options, so the combinations go into the hundreds if my math isn’t broken. I have done a few random eyes/lips to show you. So make sure you go over and DEMO DEMO DEMO, because if you are on the look out for an asian inspired skin, this one is a great place to start. This is one of the loveliest looks I’ve seen from ANY blogger in a long time. I definitely agree, This skin is fabulous on you and the styling is impeccable!